The Nvidia Shield is one of our favorite media center devices. With Android TV at its heart, it’s a powerful and versatile machine that’s just as capable for gamers as it is for TV and movie fanatics alike. Being a few years old, it’d be fair to imagine Nvidia abandoning support for the streaming-focussed box. But as proven by a major update rolling out this week, that’s not the case. Android Oreo 8.0 will be rolling out to all Nvidia Shield users in the coming days and weeks, bringing with it an all-new UI and deep Google Assistant integration. The first obvious changes come to the interface. 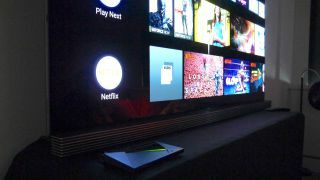 Older versions of Android TV have been been arranged into a grid of oblong shaped app icons, with trending and recent content taking up the first row, and groups of apps (such as games) following below. That hasn’t been altered drastically, but it’s now been reorganised into a system to make it faster to jump into the content you’re most likely to want. So you’ve now got a general, customisable apps row up top, followed by a “Play Next” row which lets you jump into shows or games that you’ve previously been playing. This is then followed with a selection of rows for individual “Channels”. A Channel relates to an app, and provides quick links to relevant content. So, in the case of Netflix, that might be the last thing you watched, new releases, or recommendations based on what you’ve already seen. You can then, if the suggestions take your fancy, jump straight into the previewed item without having to find it within the app itself. Rows can be customised too. The Shield will auto populate the UI based on the apps you download, but if you point your controller to the far left of the screen you’ll be presented with options to re-order the rows or remove them altogether. But a more transformational change – for UK users at least – is the introduction of Google Assistant to the equation. It’s been a part of the Shield package in the US for some time now, and though voice control was already present for UK Shield users, full Assistant integration massively enhances what’s possible. Combined with the Oreo update’s greater focus on visual cards, you can now do complex smart home tasks with the Shield. Routines allow you to control multiple Google-compatible smart home devices at once (such as dimming lights and activating electric blinds together with a single voice command), and add items to the shopping lists of connected apps like the ASDA store. It’s super smart – Google Assistant is capable of contextual awareness, letting you follow up a query with another related one without having to specifically making the Assistant aware of your historical intentions. And cards, such as directions and sports results tables, bring a visual element to your voice requests. The Shield’s power light indicator itself now doubles up as an indication of when it’s listening for a command after the “OK Google” wake phrase has activated it, pulsing green while it awaits instruction. What’s really useful in the context of a smart home is that it works even when your TV is switched off. However, what’s still unclear is if we’ll ever see a release for the Nvidia Spot. These were designed as Nvidia’s answer to the Echo Dot – small satellite mics that plugged into sockets around your home in order to control smart home functions from other rooms when away from the Shield. While Nvidia’s on-hand representatives assured us they’re still being worked on, they couldn’t offer any update on when they’ll be launching. The wait continues. Regardless of the status of the Spot, the Shield’s latest update looks great. It adds plenty of functionality to the Shield for free, making an excellent AV and gaming gadget even better. Hats off to Nvidia for continuing to invest in its users without squeezing extra pennies out of them.